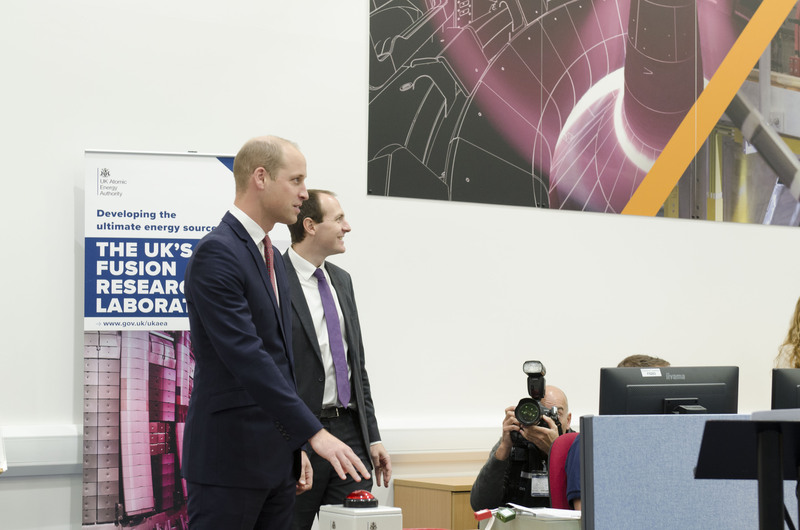 It was a special day for UKAEA yesterday as we were joined by Prince William, Duke of Cambridge, to celebrate the completion of Britain’s new fusion experiment. The Duke visited Culham for a tour of the MAST Upgrade machine and heard about the potential of fusion energy to change the world. During Green GB Week, it was a particularly fitting time to highlight research into fusion and how it could be commercialised to provide huge amounts of low-carbon electricity. The Duke heard about the five-year project to build the tokamak and stood next to the MAST Upgrade chamber where, in a few months’ time, temperatures of 50 million degrees C will be created – over three times hotter than the Sun. He then unveiled a plaque in the control room and pressed the button for a ‘glow discharge’ – a low-temperature plasma that cleans the inside of the machine during commissioning. Although the machine is not ready for experiments yet, this was one of the first times plasma was put into MAST Upgrade and represents a significant achievement by the MAST-U team. There was an agonising wait between the Duke pressing the button and the plasma glow flashing up on the screen, but all went according to plan! MAST Upgrade will be at the forefront of international research when it starts up in 2019. It will explore whether smaller reactors – the so-called ‘spherical tokamak’ design – could make future fusion power cheaper. It will also trial a novel way to exhaust heat from the large fusion reactors that are expected to be on the grid in the middle of the century. “It was nice to meet him; he seemed very interested in what we do and wanted to understand what he was observing. “Waiting for the glow to appear provided some good drama; we knew there would be a delay but perhaps not everyone did! After the visit there were tours of site for senior Government officials and industrial, academic and local stakeholders. The day ended with well-earned drinks and snacks for UKAEA staff in the Culham restaurant to celebrate the huge achievement of assembling our latest star machine. “You are doing amazing work. I’m proud of what we achieve and how we achieve it, the way we work as a team. We are a national lab performing at its peak.